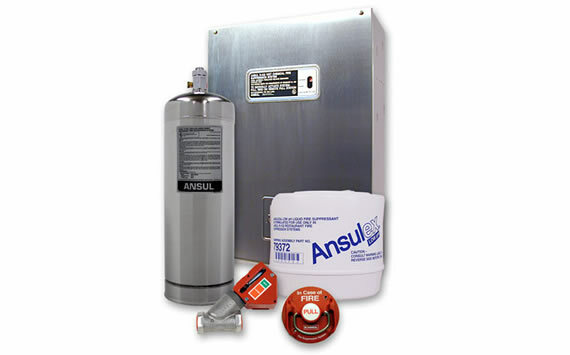 APL can offer an option in kitchen range Fire Suppression systems, however the standard that most insurance companies look for are fully met by the Ansul system, the most common one being the Ansul R-102 Ansulex R-102 Low PH Liquid. 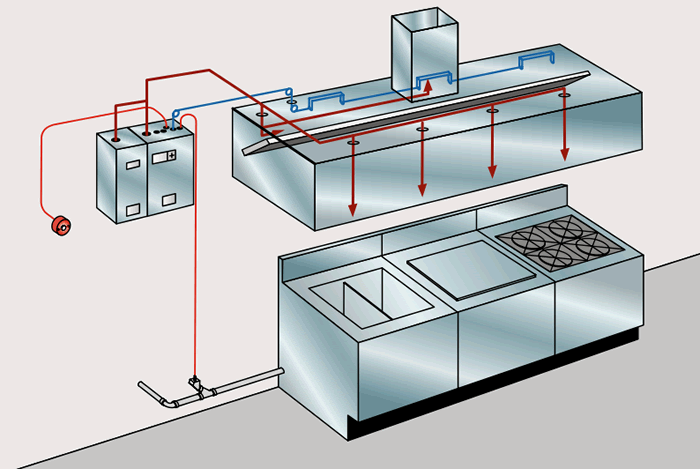 These systems comprise of a fusible link detection system within the cooker hood, nozzles above the plenum and below the plenum at strategic points on the cooker range i.e. Deep Fat Fryers. A manual release point is also available for personnel to use if they deem it necessary. The system also has a pressure switch that can be connected into the building fire alarm. 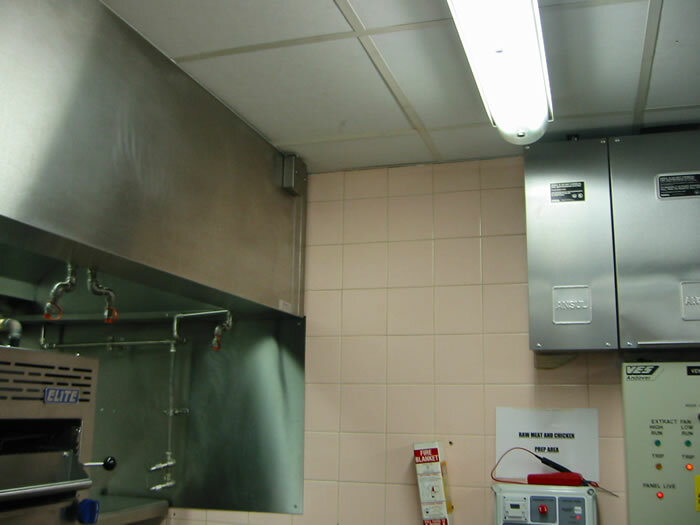 A restaurant fire can be extremely dangerous. It may start unobserved in a pan, on a grill, or in a cooker hood and within seconds it can spread throughout the kitchen or even the entire restaurant. 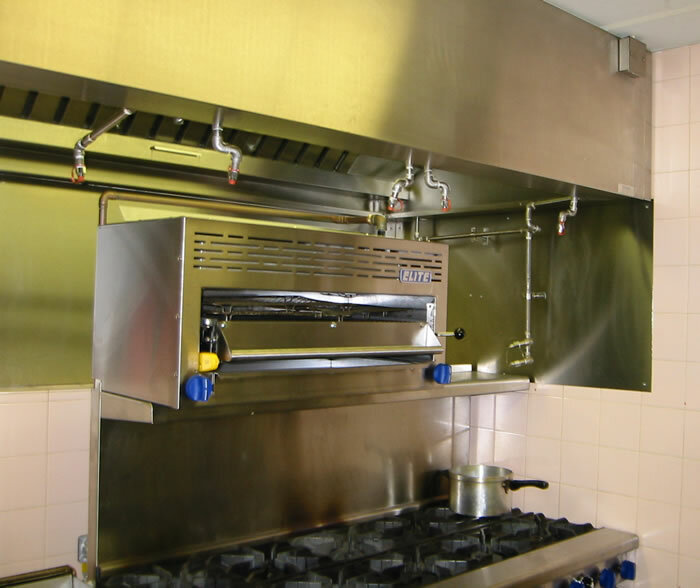 In any busy catering environment the need to protect your staff and property from fire is crucial, it's a sobering thought to realise that many restaurants never reopen after a major fire. It can not only destroy a kitchen, but a thriving business. How it works - When a fire occurs in a protected area, it is quickly detected by the sensors the cooker appliance hood. The detectors trigger the Ansul Automan releasing mechanism which actuates the system - pressuring the agent storage tank and automatically shutting off the appliance energy. The System's exclusive stainless steel enclosure is completely self contained - so blending in beautifully Without affecting the kitchen's operation. 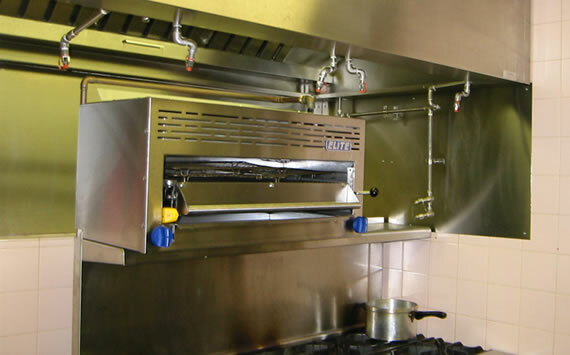 When it comes to protecting your kitchen equipment from fire - Ansul products protect more food service kitchens than any other brand. From the time-tested R-102 liquid agent system to the ultimate dual-agent protection only a Piranha System can provide. 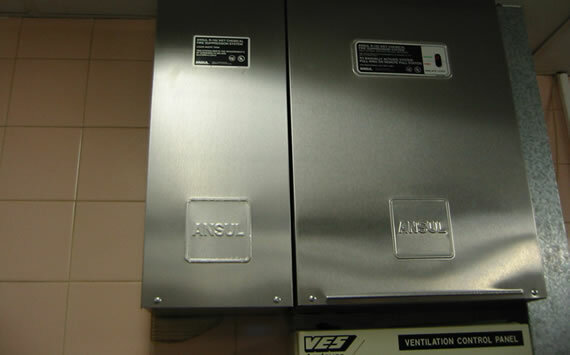 You’ll find Ansul systems in diners, fast-food chains, food courts, sports complexes, cafeterias, convenience stores, hotels, gourmet restaurants, and other food service kitchens. 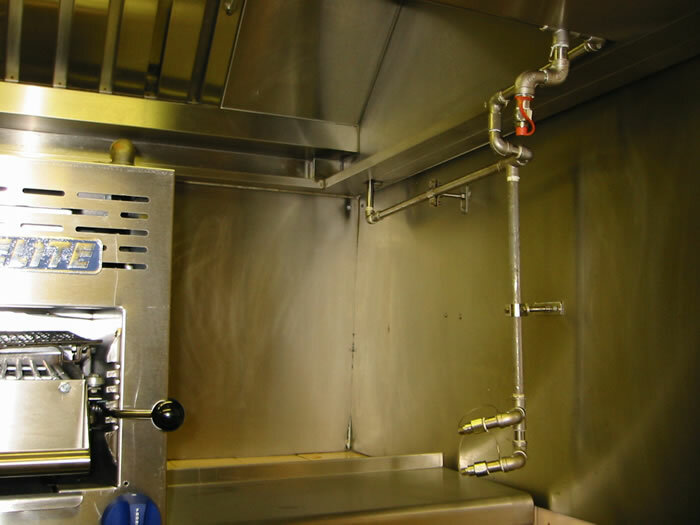 The Ansul R-102 Liquid Agent System continues to be the No.1 protector of today’s kitchen equipment. 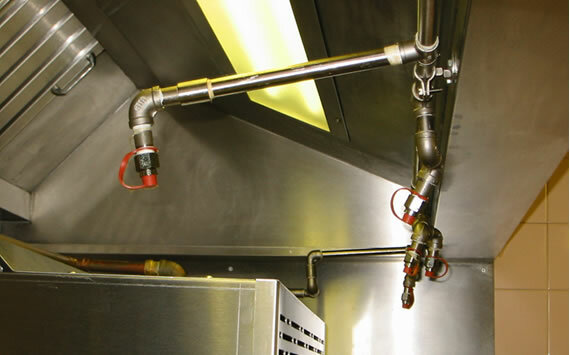 Appliance-Specific Design - The most efficient fire protection is accomplished when nozzles are selected and aimed at specific hazard areas on each appliance. This method typically provides the most economical use of liquid agent reducing the size or quantity of storage tanks and associated hardware. 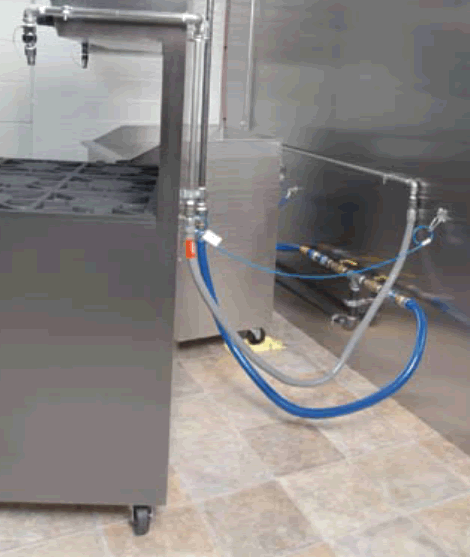 Overlapping Appliance Protection - When flexibility and simplicity are most important, nozzles are placed in a straight-line arrangement providing overlapping agent discharge patterns. This creates a virtual fire-free zone where appliances of various types and sizes are protected - even if they are replaced or rearranged under the hood. 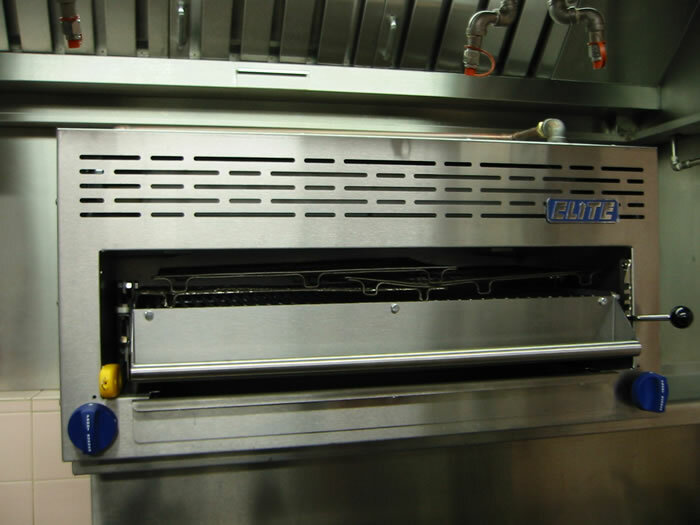 The R-102 is extremely reliable and can be recharged faster on site than stored pressure systems. It also cleans up fast so that if fire does strike. you will be back in business faster with less damage and clean-up cost.